We’ve been saying for the last couple of years that augmented/virtual reality is the fourth wave of consumer technology, and that AR could become much bigger than VR. But AR itself is not one giant wave, it’s a set of four big ones: mobile AR software, mobile AR hardware, tethered smartglasses and standalone smartglasses. These four waves could drive AR from tens of millions of users and $1.2 billion last year, to more than a billion users and $83 billion by 2021. Surf’s up. Mobile AR hardware: dedicated smartphone/tablet AR hardware and software, like Google Tango phones. Tethered smartglasses: AR smartglasses requiring a smartphone/tablet or PC host, like Meta smartglasses. Mobile AR software is the tsunami that came out of nowhere, with Pokémon GO downloaded 750 million times in its first year. But where Pikachu gave consumers their first taste of mobile AR, Facebook’s AR platform and Apple’s ARKit for iOS democratize mobile AR software at scale as true consumer platforms. Apple’s ARKit for iOS requires at least an iPhone 6s, iPhone SE, 2017 iPad or iPad Pro, with 300 to 400 million ARKit-compatible devices today. Eighty-six percent of iOS users installed iOS 10 a year after launch, so assuming iOS 11 follows a similar path and iPhones/iPads keep selling, ARKit could have an installed base of up to 400 million devices by the end of 2018. Facebook’s Camera Effects Platform is being rolled out to Facebook Messenger’s 1.2 billion MAU, WhatsApp’s 1.2 billion MAU and Instagram’s 700 million MAU (with significant overlap). Facebook migrated 15 percent of WhatsApp users to Status 10 weeks after launch, 29 percent of Instagram users to Stories less than a year after launch and 54 percent of Instagram users to Direct four years after launch. A similar growth curve could deliver around 400 million installed base for Facebook’s Camera Effects Platform by the end of 2018 too. Mobile AR hardware might take five years to reach the same scale as just one of the dominant mobile AR software platforms next year. As well as these two dominant platforms, mobile AR software is set to play out across messaging apps from Tencent, Snap, LINE, Kakao and Snow, maps apps from Google and Baidu, e-commerce apps from Alibaba, Amazon and eBay, plus consumer (non-games), enterprise, games, location-based, video and other new mobile AR apps nobody has thought of yet. The mobile AR software wave could drive more than a billion users by 2021. As with early iOS/Android, a Cambrian explosion of mobile AR apps with new dominant forms should emerge on top of these platforms (see what’s been developed so far here), making them a bonanza for developers. As mobile AR software players will be able to migrate to mobile AR hardware, tethered smartglasses and standalone smartglasses waves, mobile AR software looks like the one wave to rule them all. Mobile AR hardware’s additional sensors, CPU/GPU grunt and AR-focused device efficiency could improve user experience where computer vision and simultaneous localization and mapping (SLAM) are critical. This is despite the fact that Apple’s ARKit for iOS and Facebook’s Camera Effects Platform apps will work just fine on many standard smartphones. With phone replacement cycles at 2.5 years and high-end phones anywhere between one-third and two-thirds of smartphone sales (depending on manufacturer and geography), range-topping AR phones could deliver an installed base of tens of millions in the next 12 months, and more than 400 million by 2021. In other words, mobile AR hardware might take five years to reach the same scale as just one of the dominant mobile AR software platforms next year. This makes the mobile AR hardware user base a high-end subset of mobile AR software (except for Apple, where it will eventually be the same thing). Mobile hardware makers could do very well out of this market, and it might also have stronger monetization for mobile AR software developers with less-price-sensitive early adopters. Say “AR” and most people hear “smartglasses” (or “Iron Man”). But smartglasses’ five major challenges must be conquered for them to work in consumer markets: (1) hero device (i.e. an Apple-quality device, whether made by Apple or someone else), (2) all-day battery life, (3) mobile connectivity, (4) app ecosystem, and (5) telco cross-subsidization. While most attention is paid to what that hero device will look like and when it will get here, two of the other challenges are particularly hard to solve. Until a major breakthrough in battery technology or device efficiency, a lightweight pair of standalone AR smartglasses doing heavy-duty AR is hard to power all day without a battery pack or hot-swappable batteries (fine for enterprise users, a harder sell for consumers). This is a non-trivial problem. Plus, it’s a major risk for the developer ecosystem to invest heavily in building apps for new platforms until the installed base reaches scale. It’s the perennial chicken and egg problem that all new tech platforms face. Mobile tethered smartglasses offer a potential solution to both. It’s the perennial chicken and egg problem that all new tech platforms face. As mobile tethered smartglasses are peripherals to, not replacements for, smartphones, users will need to pay for, charge and carry two devices rather than one. That additional inconvenience and cost could limit market size to the tens of millions by 2021. By comparison, mobile AR might have billions of users in the same time frame. PC tethered smartglasses that require more computing power could remain more expensive, enterprise-focused and have smaller installed bases than their mobile tethered equivalents. They also might not benefit directly from the mobile AR software ecosystem. A parallel for this dynamic already exists in VR, where mobile systems outnumber PC equivalents 10 to one. You could buy standalone smartglasses (HoloLens anyone? ), but price (around $3,000), form factor (weighing more than a pound, limited field of view), battery life (2-3 hours), app ecosystem (limited consumer apps) and mobile connectivity (Wi-Fi only) restricts them to the enterprise market today. High-profile startups like Magic Leap are trying to solve AR’s five big consumer challenges, but standalone smartglasses look like the fourth and final wave of consumer AR (at least until The Matrix gets here). But good things come to those who wait. Mobile AR software will solve the app ecosystem. Tethered smartglasses will solve the hero device. Mobile connectivity is easy (although not powering it all day), and telcos are already selling AR phones to replace standard smartphones to drive data revenues. But all-day battery life without a battery pack or hot-swappable batteries remains a challenge. Again, without a breakthrough in battery technology or device efficiency, standalone smartglasses might not completely replace your smartphone before 2020. When standalone smartglasses are ready to conquer consumer markets, user adoption reverts to the phone replacement cycle. Early adopters will lead the charge to replace their phones with standalone smartglasses, but we’re still talking about a Tesla market by 2021. By way of analogy, Interstate 280 between San Francisco and Sand Hill Road is a Tesla parking lot at rush hour; you don’t see many Teslas in Marengo, Indiana. Since early 2015, we’ve said that Apple could deliver as great dominance and profitability in AR as it has in mobile today. Its end-to-end ecosystem of hardware, software, app store, developers and retail are natural advantages that can’t be beaten (and many have tried). Dominance across all four AR waves looks like it could be the innovation for which Tim Cook is remembered, and take Apple beyond Steve Jobs’ legacy to make it a 100-year company. Facebook’s user base, platforms (Messenger, Instagram, WhatsApp), developer ecosystem, mobile AR developer tools, mobile market experience and financial muscle guarantee its success in mobile AR software. However, Facebook’s entry into the phone hardware market did not go to plan, and Oculus is orders of magnitude smaller than the rest of Facebook. This makes a mobile AR hardware play (i.e. a Facebook AR phone) look unlikely. Mark Zuckerberg believes in smartglasses’ long-term future, but a head-to-head battle with Apple in this market might not be a fair fight. Apple’s inherent advantages and consumer hardware DNA make it the most valuable company in the world (mostly), and Facebook would be building a smartglasses hardware ecosystem from scratch. Facebook could still launch smartglasses, but sticking to its knitting as an AR software company is always on the table. Either way, expect significant Facebook investment in AR beyond the Camera Effects Platform. Tencent has as great mobile AR software potential in China as Facebook outside it, focused on the more than 846 million folks who use WeChat. 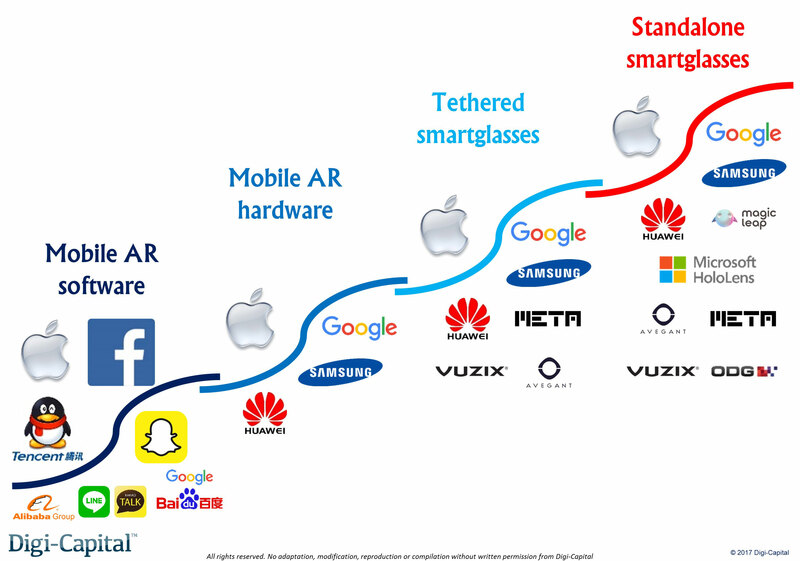 But if Tencent really wants dominance across all four AR waves in China, it could approach the AR hardware market in a unique way. Enabled by the market share of WeChat, its app store strength and the fragmented nature of the Chinese phone market, Tencent could produce a domestic version of Apple’s AR ecosystem together with major domestic phone makers. This could result in Tencent AR hardware, software, app store, developers and WeChat as the dominant Chinese AR platform. As with Facebook, Tencent also could avoid AR hardware altogether and remain a pure software player. Google’s Maps, VPS and data resources give it significant advantages in mobile AR software outside China, but it doesn’t have mobile messaging platforms like Facebook or an integrated ecosystem like Apple. Google Tango relies on hardware partners outside the top five globally (e.g. Lenovo, ASUS), but Samsung, Huawei, Oppo and Vivo haven’t signed up yet. If Google wins support from these four companies, the road to tethered smartglasses and standalone smartglasses for consumers becomes clearer. But if it doesn’t, Google would need to find another path (potentially as an evolution of Google Glass Enterprise Edition). Baidu faces similar opportunities and challenges in China, but with a different set of domestic competitors. Whether or not Google partners with them, Samsung, Huawei and other phone makers don’t have the advantages of Apple’s ecosystem, Facebook/Tencent’s messaging platforms or Google/Baidu’s data to support them in mobile AR hardware, tethered smartglasses or standalone smartglasses. To break out of today’s status quo, investments and M&As for totally new AR capabilities might be required. Apple could dominate all four AR waves and your augmented future. Alibaba has already invested heavily in AR, with a view to becoming the AR e-commerce leader in China (where it doesn’t have Tencent’s advantages as a mobile AR software platform). Given Jack Ma’s penchant for bold moves in new markets, he might consider going from Magic Leap’s lead investor to its owner (assuming it delivers on its promise). Amazon and eBay have similar AR e-commerce software opportunities outside China to sell things to folks in totally new ways. Microsoft currently has no play for mobile AR software or mobile AR hardware, and it isn’t clear that it will enter either market. Satya Nadella focused HoloLens on the enterprise, and even Windows 10 VR is being left to PC hardware partners without Xbox One X support this year. Microsoft’s enterprise focused strategy for AR (which, again, they call mixed reality) means HoloLens is their only horse in the race. When a future HoloLens is ready for consumers, Microsoft might have to try to switch mobile AR and tethered smartglasses developers and users away from Apple. That sort of thing was last done successfully by a young man called Bill Gates in 1981. Apple, Facebook and other major AR developer ecosystems might already be monetizing at scale at that stage. This could give smartglasses pure-plays the challenge of switching developers and users across from standard platforms with billions of users and network effects to proprietary platforms with a few million users and revolutionary technology. That sort of thing was last done successfully by a man in his 50s called Steve Jobs in 2007.